Millennials mean business, and they are shaking up the workplace as they enter management roles for the very first time. They are tearing down the corporate ladder, communicating on the fly, and bringing play to work. Millennials are creative, big thinkers, and they will change the face of leadership - IF they can bridge the gap between the hierarchical management style of senior executives and the casual, more collaborative approach of their peers. 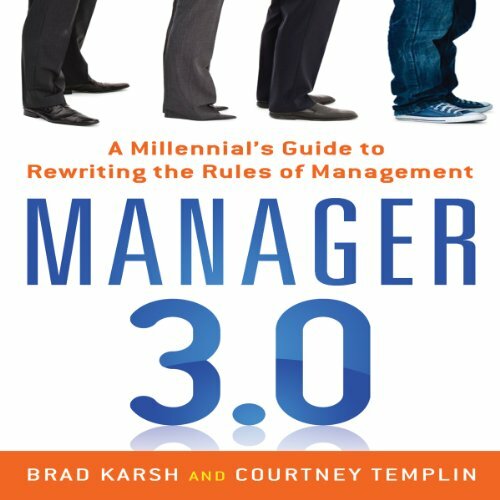 Manager 3.0 is the first-ever management guide for Millennials. They will master crucial skills such as dealing with difficult people, delivering constructive feedback, and making tough decisions - while gaining insight into the four generations in the workplace and how they can successfully bring out the best in each. Love the book, an I'm not a milenial. Insightfull. You can begin to understand how generational differences affect work relationships, how you can enhance your managerial style by leveraging differences in upbringign, which at the begining I thought as of shortcomings. I suppose if this is the first book you've ever read on management, it would be terrific! All in all, it takes what has been around for years and just repackages it with the intended audience being a millennial manager. For that, I suppose it hits the mark. In general, overly simplistic approach to all things management. At the beginning I was close to quit listening because I had the feeling this book was a collection of vast generational stereotypes. Communication, ownership, proactivity, delegation, feedback. Nevertheless if you're looking for some practical advice about management, this book may appeal to you. As an Enterprise Coach and Trainer this book provided countless practical stories, examples and quotes that will help me in my practice. I learned that I have turned into my parents :) and this book has helped me understand and better appreciate my kids and the millennials I work with at a deeper level. This book provides practical tips and techniques to bridge the gaps to help produce high performing teams. A must read for managers and coaches!